Prepare professional standard meals in no time with the 3 Piece Forged Pan Set. Comprising 18, 20 and 22cm sauce pans, you can now create a whole host of delicious home cooked dishes for all the family to enjoy. Each pan also comes complete with glass lids for increased cooking efficiency. Featuring an innovative Cerastone non-stick coating, these pans offer best-in-class properties, meaning that little to no oil is required, so you can create a healthier alternative to fried family favourites whilst eliminating arduous cleaning. What's more, these pans also offer soft touch stay cool silicone handles to enable control and comfort during use. Suitable for all hobs including induction, each pan only requires a simple hand wash to maintain its optimum performance. What superb saucepans. A bit disappointed that they are not dishwasher proof but they're so easy to clean it doesn't matter. Bought a set for my daughter who was so delighted we bought some for us! She's recommending them to all her friends now too. After years of 'non stick' the Tower Ceramic system was a revalation! Very happy with this set if pans. So easy to clean, nothing sticks to them and I find them so much better than the teflon. Very good customer service. Excellent pans. Easy, easy clean. Light weight but solid build. Have other pans in same and will buy more. Nothing sticks, very even cooking, no hot spots. They are simply the best in this style of pan. Good service and delivery from Tower. Good value for money, easy to clean, looks nice, quickly heats up. I'm really pleased with the quality. Had this set for about a month now and the non-stick is excellent. I use silicon heat resistant utensils to prolong the life. The pans are not too heavy, they heat up quickly. So far good value for money compared to similar products on the market. The only slight irritation is that after washing the lids water and soap gets trapped in the rim and under the handle, there is no way to dry this easily. Got them on offer but quality so good I would pay full price,great to cook with. These pans are very smart, great colour and lids fit well. They fit well inside one another so they are space saving as well. Delighted with my purchase. Good sized pans, good lids, non stick excellent. Light to handle. 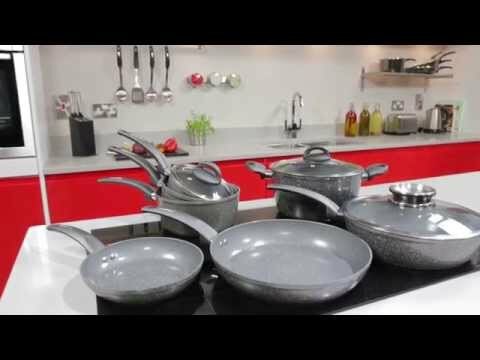 We looked at many sets of pans ,but for the price these were excellent value and quality.\nI would recommend them to anybody. We looked at many sets of pans ,but for the price these were excellent value and quality. These are the best saucepans I have ever owned. Absolutely nothing sticks and because I got them when they were on offer that's made it even more great. I Cannot believe the ease of washing these pans and they look good too. Excellent value,smart looking,easy clean best set we have bought. The pans appear to be well made, but beware if you have an induction hob. The product states it is suitable for use with induction hobs, but when compared to other non-stick and metal saucepans specifically bought for use on my induction hob it was a disappointment. The pans work, but took much longer to boil the same quantity of water. \n\nAlthough I was able to use these pans on an induction hob, they did not maximise the high speed benefits of an induction hob. I returned the pans and spent the money on saucepans purposed for an induction hob, which work much better. I recently bought this 3 piece Pan Set with glass lids. This is first time I using Tower pan, absolutely brilliant, very good sizes, ceramic coated light weight & cooks really well, thinks of buying more. Very good value for money too. Definitly recommend to anyone looking for good quality.